Back in 1953 creators Harry W. Prichett and Edwin Brit Wyckoff came up with the idea of having kids put a piece of plastic on their television screens and using a series of color markers to interact with the cartoons being broadcast. This idea became the legendary Winky Dink and You television show. Winky Dink and You was an immediate hit and remained so for almost 20 years. Kids would send away for a Winky Dink kit and sit and wait for the day’s adventure. Winky Dink’s premise was simple. During an episode Winky Dink and his faithful dog would encounter a problem such as they needed a car to take them to a store or something. One would have their plastic screen attached to the set and draw a car along the dotted guidelines shown on the screen. Then the animated characters would hop into the car and drive away. Drawing bridges, ropes, any object that Winky Dink needed, kids would learn how to draw. They would then take their magic cloth and wipe the screen clean for the next exciting exercise. 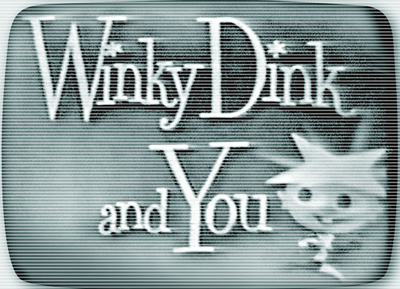 Winky Dink is a major favorite and it can be found streaming and on video now. It’s rumored that new episodes for the computer are in the works but with all the interactive games and such already at hand will Winky Dink survive the competition? He should, and here’s why. Winky Dink is an icon. It changed the face of television and is beloved at least by three generations. That fondness for an old TV show means a lot and if done right he’d have a new life on the interactive and streaming realm.